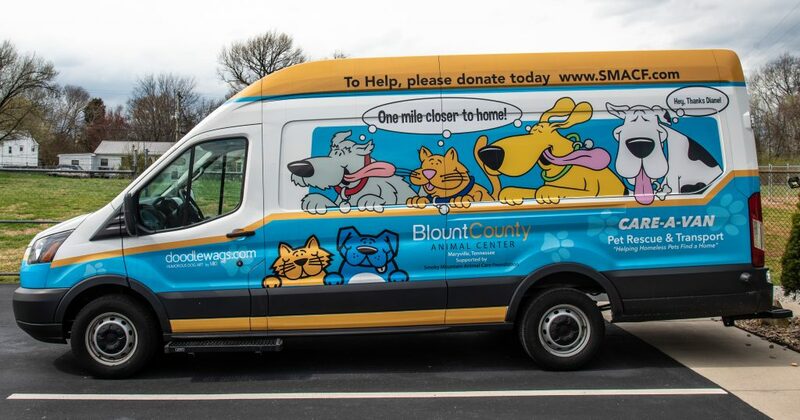 Smoky Mountain Animal Care Foundation funds a program to transport eligible animals from our area, where we have too many homeless animals, to carefully selected foster-based rescue groups in areas where there are not enough animals available for adoption. Animals considered for the transport program are screened medically and for behavior issues. Roughly two weeks before they are scheduled for transport, the animals go into foster care to be better socialized and to insure they remain healthy for their long trip to the north. Our transport program accounts for over 20% of the placements of our adoptable animals. In 2018 alone, 620 animals traveled to new homes on transport. Our Ford Transit van travels over 48,000 miles each year taking homeless animals to placements in northern states. On the day of transport, we need volunteers to help bathe the animals, walk them, and prep the van for the journey to their forever homes. If you would like to be part of this wonderful rescue mission and experience knowing that you have truly saved lives, please contact Diane D Martin at DianeDMartin@aol.com.